Doreen is the elder sister of my nephew's wife and she has sent me this recipe from her home in Himanchal Pradesh in India. Beat yoghurt, to make it smooth. 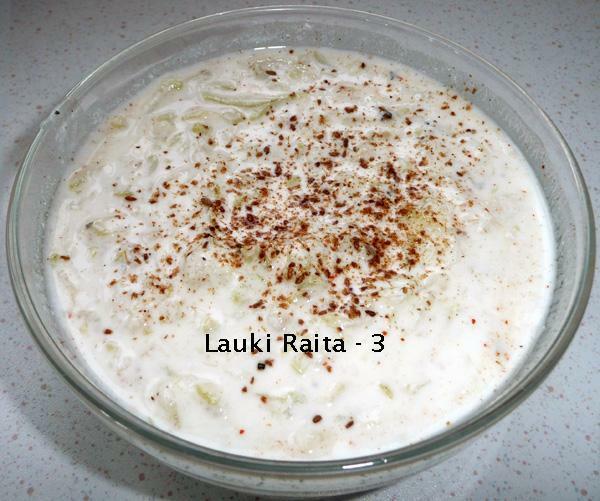 Boil lauki/gourd in salted water for five minutes, drain water. Squeeze to get rid of as much water as you can. Keep aside. To roast cumin, dry roast it on tava or griddle, till it is brown and starts crackling. Remove and coarsely crush with a rolling pin or in a mortar. Add boiled gourd, salt, crushed jeera, black pepper and green chilli to yoghurt and mix. Place in a serving bowl and garnish with fresh coriander and/or mint leaves. Serve chilled with Indian meal. You can also serve it as a dip, with tiny Nan breads or Tandoori roti squares.